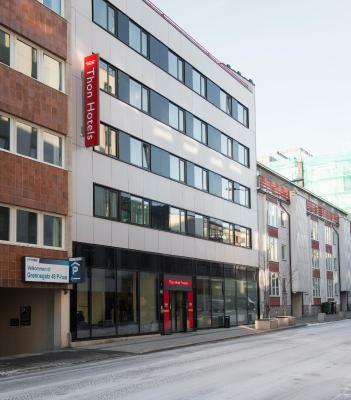 Lock in a great price for Thon Hotel Tromsø – rated 8.6 by recent guests! Very good location. Very kind and highly professional staff. One of the few hotels where I have ever been and coffee was good. Breakfast good and diverse. Perfect, comfy little hotel very close to all the shops and the waterfront. Breakfast was very good, and the bathroom had heated floor! Heaven after exploring all day in very cold weather. Excellent value during the off-season. Location, clean, good breakfast, free coffee in lobby, comfortable bed, friendly staff. Great room. Nice bed. Good desk. Fast Wifi. Free coffee in reception. Good breakfast. Fantastic location. I had let the hotel know we were celebrating my 40th. And they provided a lovely surprise package with wine and chocs. Breakfast was great and very filling. Room comfy and heated bathroom floor was a godsend after nights out aurora chasing! Great to be able to start the day with a good breakfast! Staff all very friendly and helpful. Fabulous breakfast - much more than anticipated! Small room good for one traveler - tight for two. Great location - very nice staff at reception and for breakfast. Good location just in the heart of the city. Very close to the most of the points of interest. Excellent breakfast buffet. Complimentary tea and coffee in the corner near reception. Kettle in the room. Gentle staff. Thon Hotel Tromsø This rating is a reflection of how the property compares to the industry standard when it comes to price, facilities and services available. It's based on a self-evaluation by the property. Use this rating to help choose your stay! 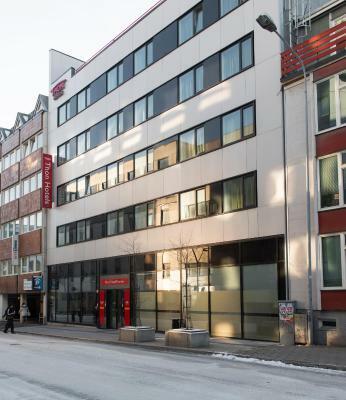 This modern, central hotel is right around the corner from Storgata, Tromsø’s main shopping street. It offers free Wi-Fi, as well as bright and stylish guest rooms. The Polar Museum is 2,450 feet away. A mini-bar and TV are found in each guest room at Thon Hotel Tromsø. All feature simple, clean décor, along with a private bathroom. Guests can enjoy a satisfying breakfast buffet in Thon Tromsø’s contemporary dining room. The 24-hour reception staff will gladly recommend area activities and attractions. 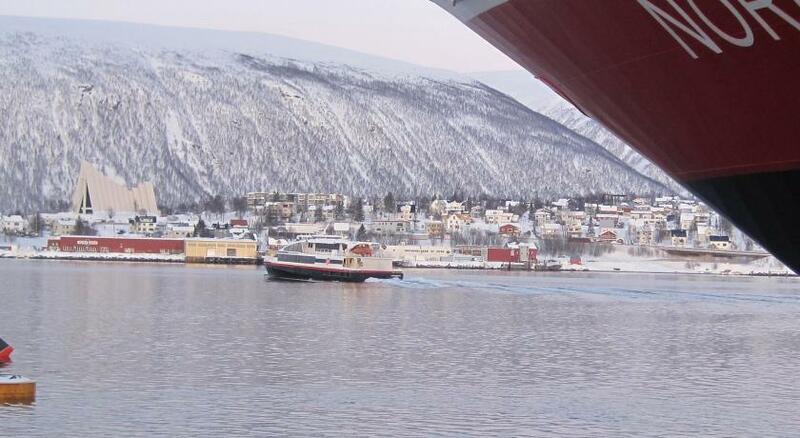 Tromsø Lufthavn Airport is less than 10 minutes’ drive from the hotel, while the Hurtigruten Ferry Terminal is only 1,300 feet away. When would you like to stay at Thon Hotel Tromsø? Bright and modern room with a TV, mini-bar and bathroom with full amenities. House Rules Thon Hotel Tromsø takes special requests – add in the next step! One child under 5 years is charged NOK 100 per person per night when using existing beds. One child under 3 years is charged NOK 100 per person per night in a crib. Thon Hotel Tromsø accepts these cards and reserves the right to temporarily hold an amount prior to arrival. Thon is and was always a good choice! Very expensive, The room was very small and had no view. It was on the ground floor and in front of my door was a little space and a wall. I could not print my boarding passes. Fortunately, the receptionist was very kind. There was no machine to get some water, for instance. In case, the receptionist was busy with people queuing up to check out you had to wait a lot to get some water. Having never stayed at a Thon Hotel before was my main reason for booking i was so happy its a 3* Hotel with 5* beds the beds are just the BEST ive slept in 5* Hotels with worse beds so comfy & warm also the breakfast is amazing the range is massive they have everything meats,breads,drinks,fruits,yogurts also all the hot foods you will not leave hungry all in with room rates. The location is very very good its a very small city & you can be any where in a few mins walk plenty of nice places too eat & drink near & all the shops id highly recommend the local bus from TOS over the Flybus they both stop very near each other just on oppsite streets & local bus is 50NOK 1 way or 100NOK both ways Flybus is 160NOK return. They have a small gym too use in Thon Hotel Polar over the road which is OK they need some curl bars & some other handles for the multi stations as they only have D-handles but its clean & warm & you can do a workout. As already said FREE Coffee & Tea in reception whiich is used flat out & NEVER did i see it run dry they keep it well stocked fair play. Im highly recomending this Hotel too anyone. The room I lived in was not with good city review. It’s a real pity for me. Very narrow beds. Small room, no space for suitacase and clothes. Small breakfast restaurant when the hotel is fully booked. Really nice people helpful, nice and clean, best brekfast!! There is only one piece of feedback. I booked a twin room, for two people but there was only one mug in the room for tea or coffee, yet there were 2 glasses. Two mugs would be good! although we found the hotel a bit expensive coming from South Africa , we found it clean, great service from the front desk , and the breakfast surpassed our expectations . thank you a very pleasant stay . we will reccomend your hotel in future.